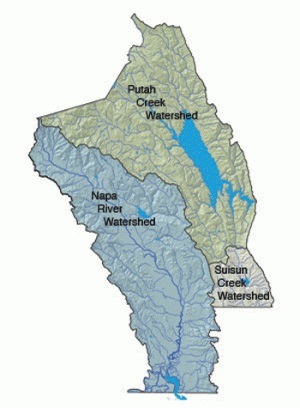 There are three major watershed basins in Napa County – Napa River, Suisun Creek, and Putah Creek. Urban and rural communities throughout the county use water derived from these major watersheds in the form of surface water, groundwater and imported water, delivered via the State Water Project. Understanding and managing our impact on the watershed is key to ensuring a more environmentally sustainable future. Monitoring, water conservation and stewardship projects, like rainwater harvesting and /river/creek restoration, help us better understand and maintain a healthy watershed. Community awareness of how our watershed functions is an important element of water and watershed management. Local events and workshops are a great way to learn more about your watershed and what you, as a watershed steward, can do to manage and protect it. Every other year, the community gathers at the Napa County Watershed Symposium to learn about and discuss watershed health – including the latest and best information from watershed research and monitoring, environmental restoration programs and projects, and successful management strategies to improve watershed health and function practiced around the State.